Comments Off on The Concert Benefiting THON is Today! 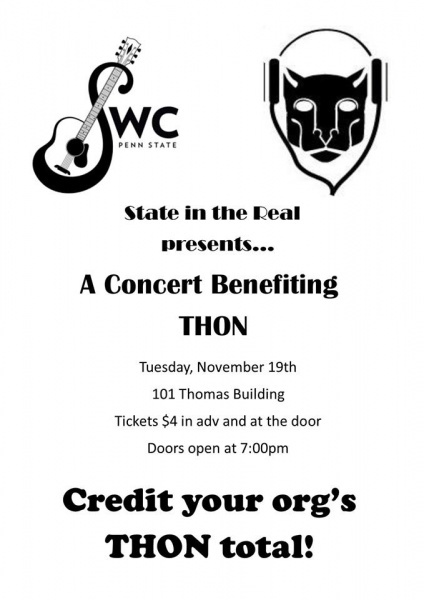 Please join State In The Real and Penn State Songwriters’ Club TONIGHT, Tuesday, November 19th as we rock out For The Kids! The event is in 101 Thomas and doors open at 7:00. By purchasing a ticket, not only are you benefiting THON, but YOU have the opportunity to credit to YOUR THON ORGANIZATION! Tickets are $4. $2 will credit YOUR THON ORGANIZATION and $2 will go towards Songwriters’ Club’s THON total. Tickets will be sold at the door tonight.